Manufacturing industries are starting to see real benefits to using technical mechanisms such as cryptography to helping their businesses. Of course there are many manufacturers who already are fully experienced in the need for and implementation of encryption solutions to protect computerized information. They deal with the government or one of the defence contractors, and have to follow the rules of the game. But the wider spread use of encryption as a means of making administration easier and providing better customer lock-in are beginning to emerge as the business managers see beyond the theory horizon of the IT technicians into using these services for business advantage. The following examples have been taken from innovative approaches that business departments have taken without waiting for their IT technicians to solve the problems. Encryption can simplify the making and distribution of product pricing lists. Naturally, the manufacturer wants his customer to feel that he has an individually negotiated series of rates and discounts, but in reality the agreement will more likely represent one of a series of pre-set agreements mainly so the manufacturer can accommodate invoicing in his billing system. But how to do that? One of the simple answers is to put on CD-ROM the whole range of price and volume discount agreements, each one encrypted under a different key. Then the manufacturer can issue the relevant key for each customer based upon their agreement. This makes for a simple distribution system 'a single CD-ROM can be sent to every customer but they can only see what they are authorized for. So for them it's personalized. Given today's e-mail turmoil how do you know if an order is real or not? One company management solved that problem by digitally signing their orders, and by issuing the recipients with their public cryptographic credentials. At a stroke their key suppliers could be certain of the authenticity of what they received. The IT department were worried about scalability, but with only 50 key suppliers involved, or ever likely to be involved (because management simply did not wish the bother of dealing with more suppliers that were really necessary) the idea of needing a grand plan that could be scaled to millions was simply not relevant or worth waiting for when the real business problem was hit on the head in a couple of days and just as quickly forgotten about. Sometimes, when you want to be sure about the security of information being exchanged, you simply cannot wait for formal agreements and so on to be put in place. You need to be able to get going right now, and to get new partners on board. One group of solicitors found that they were trying to put together a business agreement which was sufficiently sensitive that encryption was a real requirement for their client. And over a weekend? The answer was for the solicitors to issue keys to all the clients, but in such a way that each party was responsible for its own liability and could not hold the others accountable. 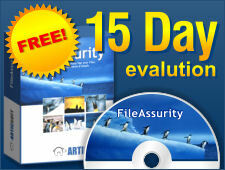 FileAssurity PGP Enterprise has this capability. The clients were then able to download publicly available software which they could use immediately with the keys provided by the solicitors. The result was a level of confidence in both the firm of solicitors and in the reliability and security of the solution as a means of exchanging sensitive business information in the future.